← Shake OFF The Salt Shaker ! 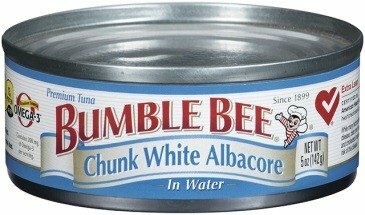 A recall has been posted about “Bumble Bee Tuna Chunk White Albacore” cans having loose seals, possibly causing illness if consumed. Be sure, if in contact with one of these 2.4 million cans of tuna, to discard it at once. For more information about the recall or reimbursement, consumers may call (888) 820-1947. Posted on March 13, 2013, in Health, News and tagged 2.4 millions cans, Bumble Bee Foods Inc., Chunk White Albacore, Recall, Tuna. Bookmark the permalink. 4 Comments. hi you have a great weblog. I wanna say thanks for publishing this cool information with us. Keep up this good work. hi u have a cool weblog. I wanna thank you for sharing this interesting information with us. Keep up good job! Your style is really unique in comparison to other people I’ve read stuff from. Thank you for posting when you have the opportunity, Guess I will just book mark this web site.